BELLEVILLE – As the night got colder their resolve grew stronger. The voices of Campbellford’s Social Justice League carried into the night. 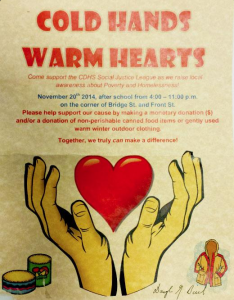 Their mission, “Cold Hand Warm Hearts”, is to raise awareness about homelessness and poverty. “Poverty is not just in Toronto and the bigger cities. It is in Northumberland. We’re out here to get in people’s faces and tell them it is important,” said Faith Begbie, 17, and in grade 12. Begbie is chairperson of the Social Justice League at Campbellford District High School . This is the second year for the Justice League’s “Cold Hands Warm Hearts” initiative. Each year the Social Justice League and its supporters station themselves at Campbellford’s main intersection, Bridge and Front Street, from four o’clock in the afternoon until 11 o’clock at night. From there they occupy the four corners of the intersection making as much noise as possible in an effort to gain the attention of cars and people passing by. “We bang pots, we make noise, and we jingle bells. It’s a lot of fun,” said Trish Wood, councillor at CDHS and co-ordinator of the Social Justice League. 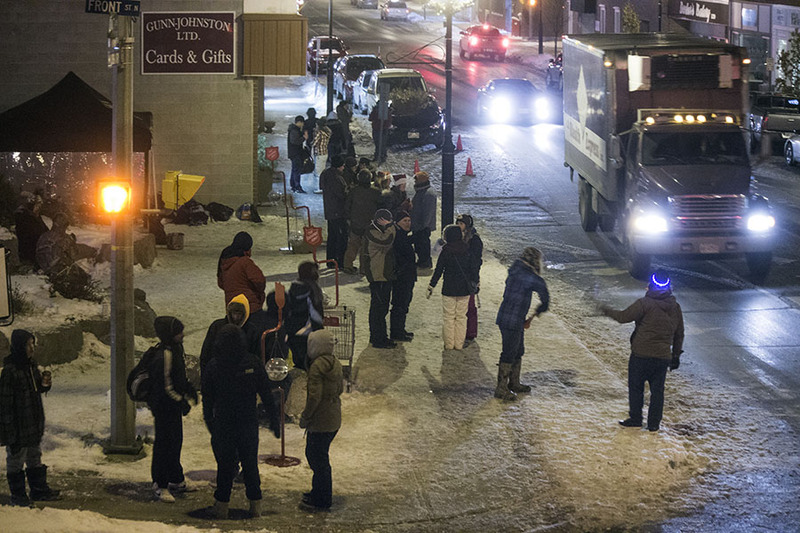 Last year “Cold Hands Warm Hearts” raised $2700 in donations, 1000 non-perishable food items and enough clothing to fill a room. “The support was overwhelming,” said Wood. Their goal this year was to raise $3000. They exceeded expectations by raising $3610, and a full truck and van load full of clothing and food. Wood said she is very proud of her students and their leadership. “There is a lot of enthusiasm. A lot of students want to make positive changes in the community,” said Wood. Kristina Nairn is the health nurse for the Kawartha-Pineridge District Health Unit . She said the campaign by the Social Justice League is a model other communities could follow. “The work by Campbellford High school, by the students, with their campaign “Cold Hands Warm Hearts” is a model for all communities to take part in,” said Nairn. Faith Begbie said the experience is a real eye-opener. “It is not just the people you see on the streets asking for money, it is people couch-hopping, it is families that may live somewhere but are not able to afford clothes or food. It really affects everybody,” said Begbie. Nick Carson, 17, and in grade 12, said he knows people in Campbellford who are in need. “Even some of my friends, they try not to admit it. I know some of them kind of need help like this from certain programs,” said Carson. Nairn said poverty and homelessness in small towns is much more prevalent than people are aware. “A lot of this includes people who are couch surfing, who don’t have an address in their own name, staying with people for short periods of time. Very precarious living situations,” said Nairn. Wood said, as a guidance councillor, she sees many instances of poverty. “I just know by being in the guidance office at Campbellford District Highschool there are many families in need. There are many students in need. It is a real issue we deal with,” said Wood. Another member of the Social Justice League, Adam Doherty, 14, and in grade 9, said he didn’t realize poverty could exist in a place like Campbellford. Cierra James, who’s in grade 11, said she realizes it could happen to anyone. “One day somebody could be completely fine and something can change in their lives where they can’t afford to buy food and clothes,” said James. As the night got colder, dropping to minus seven degrees, James said she gained an understanding for what it would be like to live outside and be homeless during winter. “I have learned that it is tough and I have a lot of respect for people who have to do this all the time,” said James. The money and clothes raised go to the Campbellford’s Salvation Army and the food will go to to the local food bank.